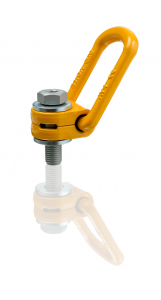 OSTALBKETTEN is expanding its portfolio into the area of lifting accessories around the YOKE product series „YELLOW POINT,“ „Blue Line“ and „YELLOW-LINE „. Here the grade 8 (Yellow Line) and the grade 10 lifting points and component parts are certified with around a 25% increase in load capacity (Blue Line), complemented by lifting points for mounting and welding from the „YELLOW-POINTS“series. The product lines meet the highest quality standards and are 100% electromagnetically crack tested. Technical product details about the YOKE load ring LBO in grade 10 can be found in our shop. Further mounting and welding lifting points are in the pipeline and will gradually follow. • All load rings meet the requirements of the machinery guidelines.